Learn how to understand and apply the key updates to the FY2019 code set, including new, deleted, and revised codes. During this 60-minute webcast, expert speaker Megan Batty, HCS-D, HCS-H, will help attendees understand and apply the key updates to the FY2019 code set, including new, deleted, and revised codes. You’ll get the latest on the 15 new codes for postprocedural infections as well as the changes to neoplasm coding with 45 new codes to report malignant and benign neoplasms and melanocytic nevii of the eyelids. Megan Batty, HCS-D, HCS-H, has worked for DecisionHealth since 2008 as a graduate fellow, editor, junior product manager, and now coding product & content specialist. 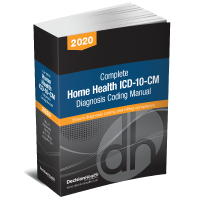 She has covered multiple aspects of home healthcare for Home Health Line, OASIS-C & Outcomes Solutions, and Private Duty Insider, but has spent most of her time writing about home health diagnosis coding as the executive editor of Diagnosis Coding Pro for Home Health. She’s worked on many of DecisionHealth’s industry-leading coding products, including the Complete Home Health Coding Manual, the Coding & OASIS Field Guide, and the Home Health Coding Companion and Documentation Trainer; she was also the developer of the Wound Coding & OASIS Field Guide and the new Ultimate Guide to Home Health Diabetes Coding & Documentation. No problem. The On-Demand version will be available. Use it as a training tool at your convenience—whenever your new or existing staff need a refresher or need to understand a new concept. Play it once or dozens of times. A $249 value! Participation in the webinar is just $249 per site. All materials must be retrieved from the Internet.